As technology becomes more affordable and customer expectations continue to rapidly evolve, there has been a noticeable shift within organizations as it relates to departmental technology spend. A role once assigned to CIOs and IT personnel, a group focused primarily on critical operational requirements, the responsibility of purchasing and maintaining the latest technology has fallen into the lap of those who play a more integral role in the customer experience—“the business”. 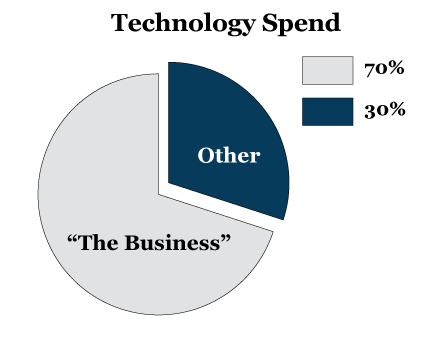 Who exactly is “the business” comprised of? Middle management, i.e. contact center directors, marketing and sales executives, VPs, and customer service managers, to name a few. Forrester Research Group reports that 70% of technology spending in North American companies of more than 250 employees is either “business” led, or heavily influenced by “business”, a number that has grown significantly in recent years. And 50% of business managers, directors, and vice presidents are increasing their departmental budgets on technology products and services over the next 12 months.